I began home schooling with one student in second grade and four kids running around the house distracting us and making a mess. I had the foresight to understand that I would need order, and a lot of it, in all areas of my life. Beka is removing her MONDAY FILE. On a minuscule budget, the Lord blessed my shopping one day by with these white file boxes, two in a package, for $2.50. I bought enough for each child and a few extras. The boxes are now “teenagers” and still used, although worn and slightly tacky from left-over sticker residue. I have a file for each subject, one for goal charts, one for special projects, and at times, have included Sunday School or Kids Bible Club (like AWANA) files to include all aspects of their lives that need daily or weekly attention. 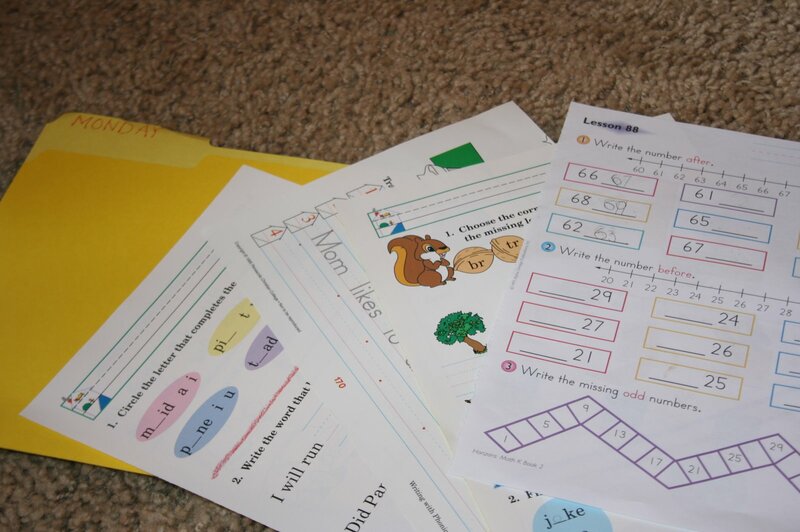 I remove the pages from the workbooks and fill daily files for 2-4 weeks at a time. 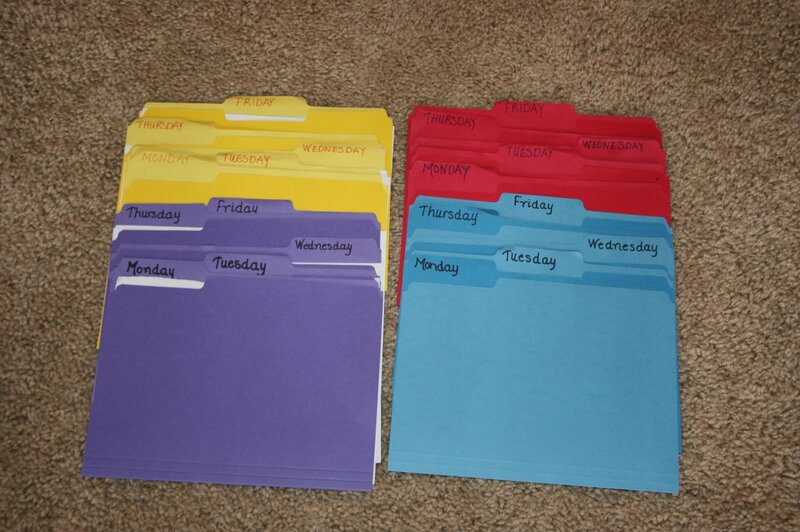 Colored folders make it easier to tell what week you are on. than the smaller cellophane wrapped packages. At the beginning of each year, I create a simple chart with classes on the vertical and the days of the week across the top. I have also included Bible reading, memorization and chores. you can’t go back and see what work they have done. We prefer highlighters or colored pencils. If you file all the charts, it also keeps track of the number of your school days. As each worksheet is completed, I correct it and hand it back to the child. They do the problems over until they are correct. This is one of my main teaching strategies; we don’t go on to another lesson until the previous one is mastered. or, they might have not have put enough effort into their work. A finished page receives a smiley face, a sticker, or a rubber stamp, before being filed. If a concept is not understood, the following lessons will not land on a firm foundation. I would rather repeat a lesson, patiently and kindly, and allow them to be successful, instead of moving on in frustration. I also make them write each misspelled word ten times – this is K-12. If they miss a simple math fact, I may make them write that ten times, as well. Repetition does aid memory! It can also be overhwhelming, so use discernment. As the years flew by, I began teaching the other kids, then added a sixth child to the family. I was very thankful I had started school in an organized fashion. 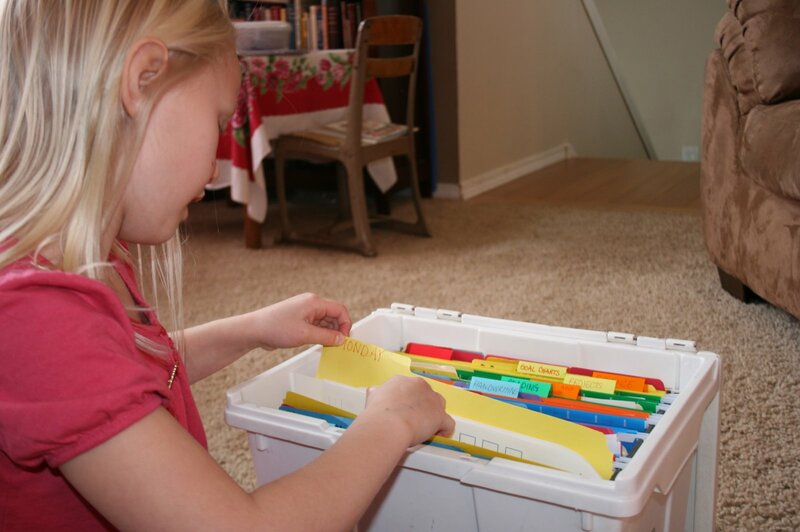 Each day, all of my kids went to their file and pulled out what work needed to be done. The only problem came if I hadn’t kept up my end of the system, and hadn’t assigned goal charts or filled their files. This system actually works with just the daily filing system, OR just the goal chart. I have worked this system in many different variations over the years and have found it to work for me. I never said that my children did all the work without complaining. 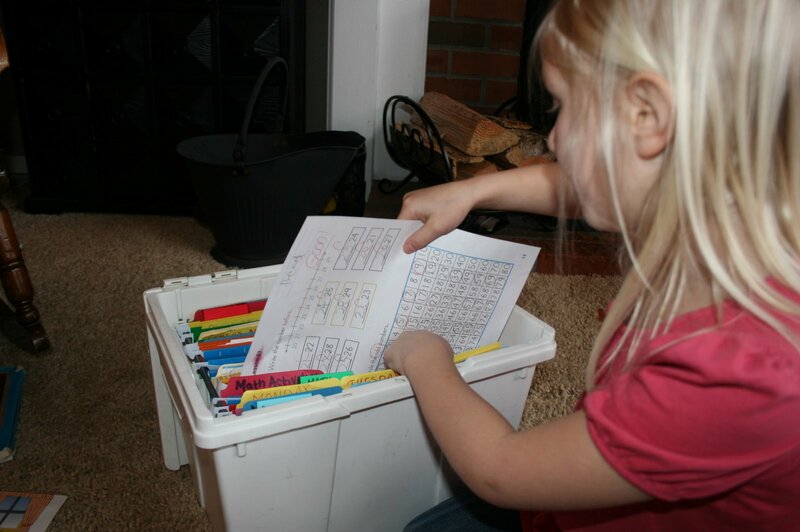 I never said I haven’t found worksheets hidden in toy boxes or under couch cushions. I never said we didn’t spend hours looking for a PENCIL so we could actually do the worksheets. I never said they were finished with school before the school buses rolled by the house. I never said that each worksheet was taught in a patient manner. We’ll talk about that later…. …..after you get your school organized! 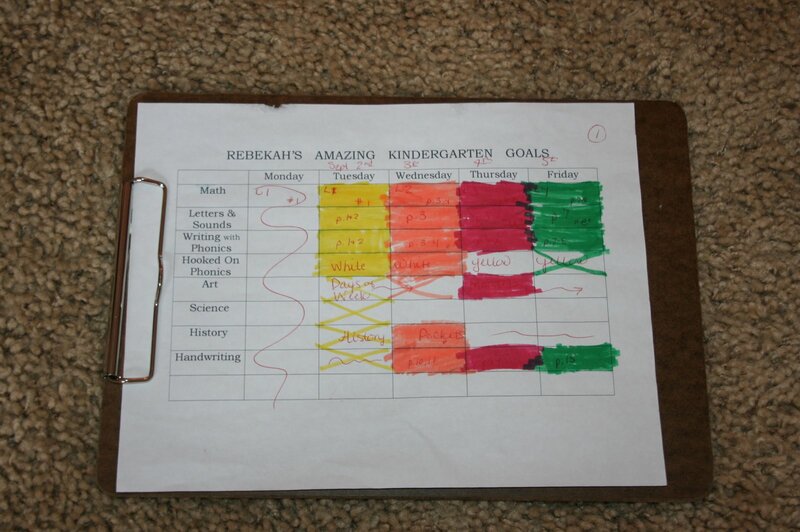 This entry was posted in daily work, goal charts, organizing your home school on March 24, 2009 by Mindy. Organisation is a must. I love to see how others organise. Looks great.